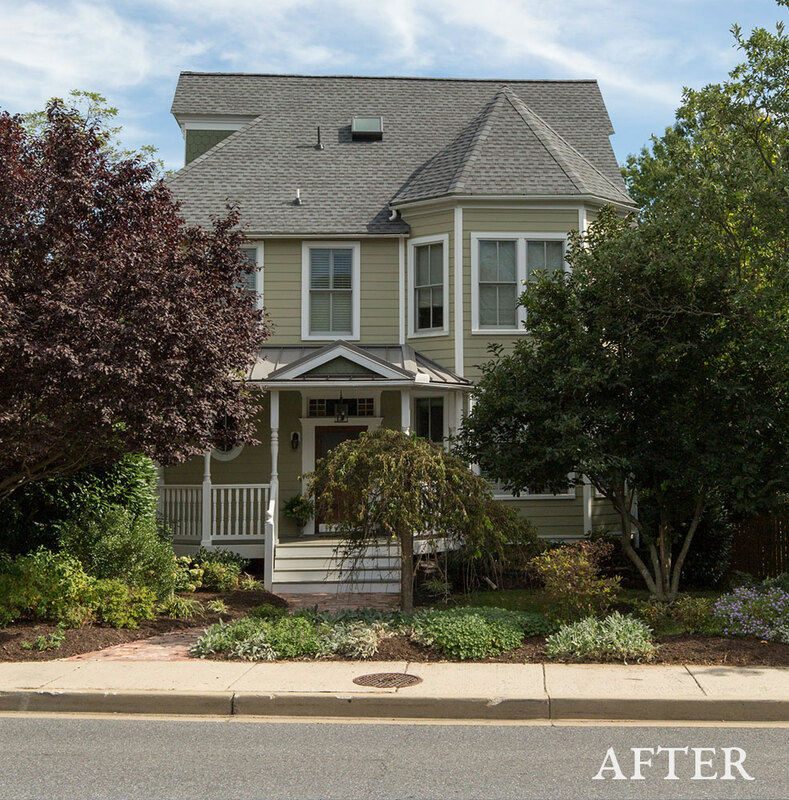 The off-center front steps of this Rockville Victorian dead-ended in a patchy grass lawn surrounded by a few mismatched plants -- but this exterior makeover called for more than landscape design. 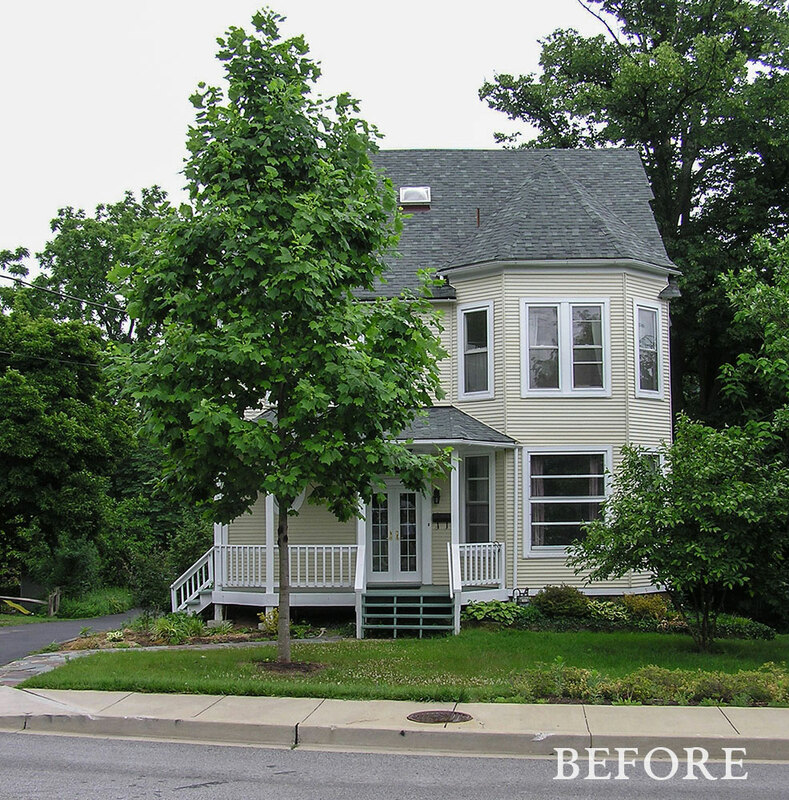 Even after replacing worn vinyl siding with wide cement boards and scallop details, the owners knew their home lacked period charm, and felt that a misguided, decades-old porch renovation was partly to blame. Armed with historic photos of the home, Old House Loves tackled the wish list: restore the graciousness of the original porch without investing in a total tear-down; provide a clear sense of entrance for visitors, and design a cohesive landscape that provides some buffer from the busy street while still signaling "welcome." Old House Loves accomplished the porch makeover with a combination of modest changes with big impact: adding a small roof gable for height, relocating one post to widen the steps and center the door, replacing the square posts and balusters with more detailed reproductions, and vaulting the ceiling to make the space feel grander. New stain, paint, and lighting completed the transformation. Beyond the porch, Old House Loves designed a new landscape centered on a curving walk of bricks salvaged from a Baltimore row house, and included specimen plum and weeping cherry trees for interest, evergreens for privacy and noise abatement, and layers of hydrangeas and other blooming shrubs.